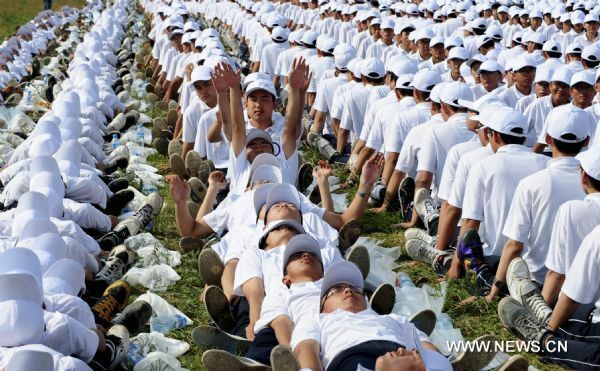 August 12th, a group of 10,267 succeed at breaking the new record for human dominos. The entire event involved 10,267 students. Everything was planned out with perfect precision, including the what colors each person should wear. The human dominos event in action. The entire event took just under two hours to complete. All I have to say is wow! This must have taken a lot of patience. I hope people brought a snack with them for when they were waiting. This entry was posted	on Thursday, August 19th, 2010 at 12:00 PM	and is filed under Cool, Videos. You can follow any responses to this entry through the RSS 2.0 feed. You can leave a response, or trackback from your own site.